It's that time again, when political parties release their 80 page, forest destroying election pledges for the general public to read...or not read as the case may be. But fear not, lucky reader, I'm reading them so you don't have to. So far I’ve only gone through Labour’s gripping bedtime read, but as more parties bring out their novels, I’ll update you with all the exciting stories and claims they bring. The Labour Party – A healthy dose of populism surrounded by an attempt at economic credibility. Similar to Ed Miliband’s appearances in the election interviews and debates, there is one main point to take from Labour's election manifesto – ‘we've learnt our lesson and we can manage the economy ’...apparently. But the big question for Labour is, how to convince the voters? Well, it’s simple, Labour will not borrow any money to meet the pledges in their manifesto, instead it will come from much beloved tax rises and spending cuts. They claim they’ll cut the deficit year-on-year in the next parliament until it is eliminated and all their policies are fully costed. The Party even promise to bring in a law that forces election manifestos to be reviewed by the Office for Budget Responsibility to see if promises can realistically met - that’s the apparent confidence Labour have in their new found fiscal responsibility. But is it too little, too late? The Conservatives and Liberal Democrats have been attacking Labour for weeks, claiming they'll increase taxes for working people and borrow more just to recklessly spend, thus damaging the precious “long-term economic plan.”This seems to be Labour's grand response, but with 20 days to go, it might prove to be too late for most voters - although I’m sure the Tories are enjoying constantly reminding the public of the ‘bad old days’ of Gordon Brown's premiership. The ‘populist-lite’ (I coined a phrase!) policies to reverse the “cost of living crisis” are there too (Labour’s alternative to the oft-quoted “long-term economic plan” perhaps?). Highlights include: a return of the 10p and 50p tax rates, increasing the minimum wage, banning “exploitative” zero-hours contracts, freezing energy bills and rail fares. All things we’ve heard before, but all things that should appeal to voters still struggling under the Coalition. Labour attempts to play to it's strength, the prized NHS, promising to repeal the controversial Health and Social Care Act, improving mental health provision and increasing the health budget – although by less than the Tories and Lib Dems have pledged. They are also trying to reposition themselves as the party for the young, attempting to steal the Lib Dem’s fallen crown. Seductive policies include: votes for 16 & 17 year olds, increasing the number of apprenticeships and, of course, a drop in tuition fees. Unfortunately for them, young voters are more likely to be swayed by the arguments of the austerity ending parties – the SNP, Plaid Cymru and the Greens. Fighting off the rise of all of the nationalist parties, they are pledging devolution to the English regions and cities (their alternative to English votes for English laws), reaching out to the city dwellers that wish to follow Manchester in its rise to be England’s second city - Northern Powerhouse anyone? Their promise of Home Rule in Scotland is feeble at best, an attempt to fight the unstoppable SNP DevoMax revolution. And, oddly, a pledge to reform the House of Lords into a Senate of the Nations and Regions, an interesting proposition (although one I disagree with) especially considering there is as much objection to this in Labour as there is in the Tory party. Finally, Labour promises to help reform the EU, much like David Cameron, however there is no commitment to a referendum on these changes. It’s unlikely that Miliband would have the leverage in Europe without the threat of leaving if he failed. 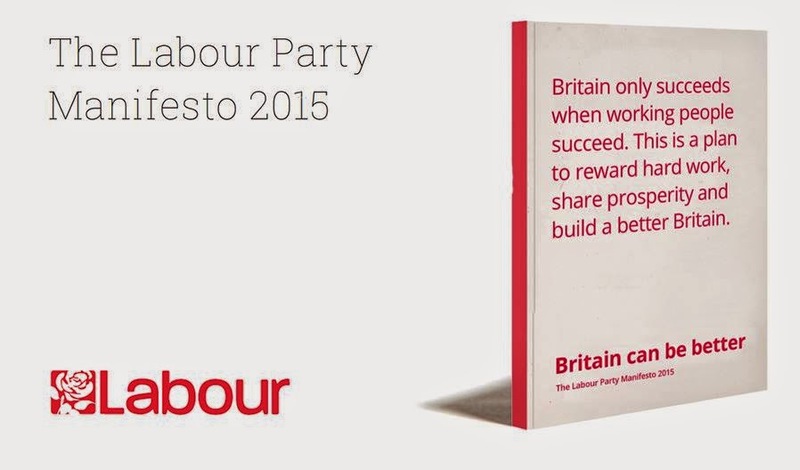 Although strong, Labour’s manifesto is likely too late for it to restore itself in the eyes of disillusioned voters. Many will vote Conservative, frightened by their rhetoric on Labour's borrowing plans, young people will vote Green (or the SNP and Plaid Cymru) swayed by their pledge to change politics for the better – or will unfortunately not vote at all – and the Scot's will vote SNP, believing that only they can bring real change north of the border. Wow great blog mate. Really interesting read!